Mix all the ingredients for the soup stock in a pan and let it boil. After it boils, let it cool down. 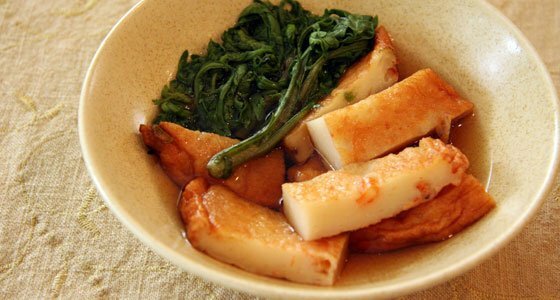 Boil water in a different pan and briefly boil the shungiku. After the shungiku is briefly boiled, place in cold water. Squeeze the shungiku to dispense the water and cut in 5 equal parts. Cut the satsuma-age in consumable sizes and soak with the shungiku in the soup stock for a little while.